Frustrated with standard suspenders that fall off your shoulders and restrict movement when doing tasks overhead? 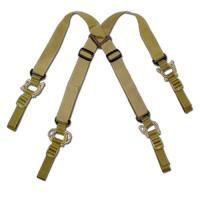 Look no further than the High Speed Low-Drag Suspenders from High Speed Gear. Crafted from 1.5-inch webbing and elastic shock-cord loops, the suspenders move with wearers throughout extended physical activity. A non-slip divider at the back ensures suspenders stay put on the shoulders, optimizing and reducing stress when reaching for items. The tails for each connecting point can be tucked away, or even cut, while the hook material is sewn on, serving as a keeper when attached to belts. Use the Low-Drag with a regular belt, padded belt or over a Rigger's belt. The suspenders are made in the USA and covered by HSGI's® Lifetime Warranty.